"I can resist everything but temptation." ​Like most people, I strive to be reasonably fit. I walk religiously, eat my vegetables, and sometimes even do yoga. But I have a serious weakness, a secret yearning for what can only be called the dark side. By dark, I am speaking literally, for I find that I can resist everything but chocolate. In more youthful, disciplined days, I would nibble only on small pieces of severely dark chocolate so bitter that I felt rather saintly; but as I mellow with age, I find myself drawn back to the sweeter confections that I loved as child, before saintly self-denial set in. I'm talking chocolate brownies, chocolate chip cookies, chocolate cake, gooey-filled chocolates, and that devil of darkness: fudge. Oh, sweet chocolate, forbidden one, how I yearn for you! I could write sonnets to your name, and I dream of stolen moments . . .
Oh, but it was not love at first sight! I was highly skeptical. The ingredients put me off. How can something called “Black Bean Brownies” (see recipe below) be any good? It sounds ridiculous, counter-intuitive, jolting—beans and chocolate? Together? In a brownie? Was this a joke? But then I baked up a batch and fell in love. This led to other relatively healthy chocolate recipes and my own cocoa and bean experiments. 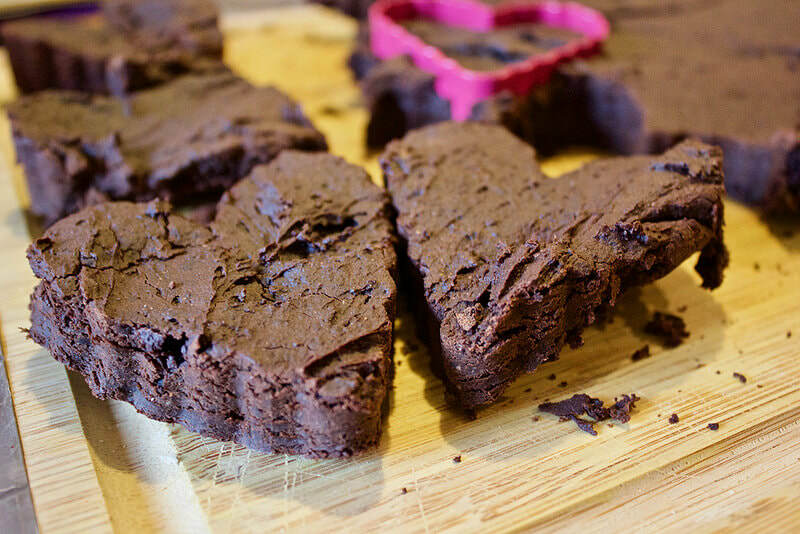 In the process, my chocolate brownie passion vs. healthy vegetables began to feel less like a struggle between the Montagues and the Capulets, and more like a curious exercise in child-like creativity, the kind where anything is possible. As I reflect on the mysteries and ironies of life well beyond beans and brownies, it occurs to me that our struggles and our joys, our flaws and our gifts, our sense of duty and our yearnings for pleasure—all these contrasting, colliding, disparate elements can make for a rich and delicious life, that is, if we can let loose of our need for absolute orthodoxy. We don’t always have to choose between either/or. And there is more to life than dreary compromise. There is imagination, and it can astonish us. If we can make a space in our souls for novelty—that imaginative pairing of contrasting ingredients--we don’t always have to choose between health and happiness. If we hitch our imaginings to our courage, we can dare to experiment with a new thing: something wholly unexpected. Something fresh. Something that makes us smile again. In process philosophy we call this fresh “something” creative transformation. In church we call it grace. The philosopher Alfred North Whitehead believed that God, the very Soul of the world, is something like a loving, creative chef who works with contrasting, odd, and sometimes wholly incompatible ingredients to bring about novel possibilities for well-being. Far from a lackluster compromise, divine novelty yearns for an intense harmony of otherwise disparate elements--the most creative possibility for a particular moment in time. Whitehead calls this Beauty; and Beauty, I believe, is what makes life most delicious. But rich, creatively-birthed possibilities are not fully real until they are actually tasted and eaten and realized in the world--by you and me. Divinity needs us! It is up to us to allow novel possibilities some play in our imagination, to taste them thoughtfully, and with a dollop of courage, incarnate them into the world. We are called—as in holy communion—to take, eat, and find ourselves whole again. Perhaps if we could widen our souls and make room for imaginative flights once in a while, we just might find ourselves in that sweet spot where health and happiness shake hands, where political enemies and cultural warriors embrace a more creative tension, and where religious opponents and ideological hardliners can finally lay down their swords in the holy resting place we call kindness. If we are not blinded by fear and rigidity and self-righteousness and perfectionism and “either/or” thinking, we might be able to make a space for creative grace. And in our struggles between extremes, we can trust in the transforming power of delicious Beauty; for it is born of divine novelty, creativity, and our own sense of trust in the wildly imaginative. So take heart, all ye who struggle with sweet chocolate cravings or love or even despair over this world. Grace is baking in the oven. And it smells like heaven. Put all ingredients, except chocolate chips, into a food processor. Blend until smooth. Pour mixture into a pre-oiled brownie pan and top with chocolate chips (press them into the batter). ​Bake 350 for 18 minutes. Let sit for at least 10 minutes before cutting. For those on special diets, this recipe is gluten free and low-glycemic. Enjoy!